Carnegie Europe is a think tank that shapes debates and informs decisionmakers on the most consequential threats to European and global order. We are part of the Carnegie Endowment for International Peace, which has other centers in Beijing, Beirut, Moscow, New Delhi, and Washington, and an office in Silicon Valley. Carnegie’s network—more than a century old—gives us access to top experts around the world while allowing us to retain our intellectual and editorial independence. Our all-European roster of scholars counts some of the continent’s most influential thinkers and statesmen among its members. Andrew Carnegie founded the Carnegie Institution of Washington (now known as the Carnegie Institution for Science) in 1902 as an organization for scientific discovery. His intention was for the institution to be home to exceptional individuals—men and women with imagination and extraordinary dedication capable of working at the cutting edge of their fields. Today, Carnegie scientists work in six scientific departments on the West and East Coasts of the US. Carnegie investigators are leaders in the fields of plant biology, developmental biology, Earth and planetary sciences, materials science, astronomy, and global ecology. Carnegie Council was founded in New York City in 1914, when Andrew Carnegie assembled a group of religious leaders of different denominations and appointed them trustees of an organization named the Church Peace Union (CPU). Through the CPU, Carnegie hoped to make war obsolete. The mission of Carnegie Council is to enlarge the audience for the simple but powerful message that ethics matter, regardless of place, origin, or belief. As the EU’s law enforcement agency, Europol has a mission to support its Member States in preventing and combatting all forms of serious international organised crime and terrorism. Europol’s vision is to contribute to a safer Europe by providing a unique and evolving set of operational products and services to support law-enforcement authorities in all Member States. Europol set up the European Cybercrime Centre (EC3) in 2013 to strengthen the law enforcement response to cybercrime in the EU and thus to help protect European citizens, businesses and governments from online crime. Since its establishment, EC3 has made a significant contribution to the fight against cybercrime: it has been involved in tens of high-profile operations and hundreds on-the-spot operational-support deployments resulting in hundreds of arrests, and has analysed hundreds of thousands of files , the vast majority of which have proven to be malicious. The OAS came into being in 1948 with the signing in Bogotá, Colombia, of the Charter of the OAS, which entered into force in December 1951.The Organization was established in order to achieve among its member states—as stipulated in Article 1 of the Charter—"an order of peace and justice, to promote their solidarity, to strengthen their collaboration, and to defend their sovereignty, their territorial integrity, and their independence." Today, the OAS brings together all 35 independent states of the Americas and constitutes the main political, juridical, and social governmental forum in the Hemisphere. In addition, it has granted permanent observer status to 69 states, as well as to the European Union (EU). The Youth Peace Initiative (YPI) was founded to give youth in conflict areas a chance to participate in peace processes. While people across the world are divided, younger generations are often not included in the efforts to shape their shared future. Therefore, the founding interest of YPI has been to include younger generations in the decisions of the present which affect their future, in order to create or maintain a sustainable peace. Over the years the organization and its initiatives continued to grow by hosting conferences, lectures and activities to bring young people from these areas together and to promote shared understanding and a common vision. UNOY Peacebuilders is a global network strengthening sustainable youth-driven peacebuilding. We connect 80 youth peace organizations across 50 countries. Our goal is to create a world where young people have the opportunity and skills to contribute to peace. We work to strengthen youth-led peacebuilding initiatives, facilitate a safe space for dialogue and conflict transformation, develop the organizational capacities of our members and to bring the voices of young people to policy makers on a regional and global level. We support youth peacebuilding organizations and to build their capacities. We advocate for increased youth participation in peacebuilding, in the shape of the UN Security Council Resolution 2250 that recognizes and addresses the specific needs, assets, potentials, and experiences of youth in (post-) conflict scenarios. 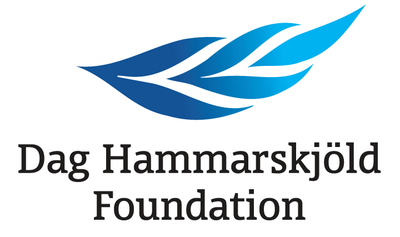 The Dag Hammarskjöld Foundation is a non-governmental organisation established in 1962 in memory of the second UN Secretary-General, which aims to advance dialogue and policy for sustainable development and peace. Working in the spirit of Dag Hammarskjöld, we aim to strengthen policy on international cooperation, development and peacebuilding through dialogue, meetings and publications. Within our programme areas, we generate new ideas and perspectives to stimulate discussion and action, and we convene a diverse set of stakeholders to advance processes. The mission of the United States Embassy and Ambassador Peter Hoekstra is to advance the interests of the United States, and to serve and protect U.S. citizens in The Netherlands. The cooperation with the United States Embassy is based on the heritage of Andrew Carnegie, who lived the ‘American Dream’ by moving to the United States as a Scottish worker, and became the owner of the Carnegie Steel Company, now known as U.S. Steel. Taking an interdisciplinary approach, Armistice Suisse is deeply committed to European and World Peace diplomacy. This educational and cultural project in commemoration of the humanitarian tradition of Switzerland contributes to the compelling history of the United Nations and its mission for global Peace.